Glacier, March 16, 1996 (balloon) - I helped with communication ops and launch/recovery activity. Seeing live video of a payload cut loose from 94,000 feet above a weather front crossing Colorado is irreplaceable, especially when your impressionable 9-year old child is with you. The payload tested magneto-torquing effects. Blue Moon, May 17, 1996 (balloon) - Flown to test active thrust stabilization of a platform. I spec'd, designed, and helped build/debug the telemetry modulation and communications subsystems. Falcon Gold, April 20, 1997 (balloon) and October 24, 1997 (satellite) - The Falcon Gold project included designing and building a satellite payload that hitched a ride on an Atlas booster in October 1997, after flying a prototype on a balloon to 106,000 feet. The satellite successfully collected samples of the GPS spectrum from above the constellation and downlinked data to ground stations we borrowed from NOAA. I selected ground station software, working specifications with a contractor, and caressed the Falcon Gold telemetry link for the most data possible. The mission was covered in publications of the USAFA, AIAA, and AMSAT. We received a special AIAA team award for this work. Several people authored a technical paper about using GPS signals to navigate in a Geosyncrhonous Transfer Orbit. FalconSat, May 2, 1998 (balloon) - The most recent effort was a satellite designed to study charging effects, with concurrent commitment to a bus design versatile enough for future launches. My primary emphasis this time was supervising and teaching cadet teams who are building the Command Telemetry and Data Handling hardware and software. The first satellite under this program launched in Nov 1999. In addition to hands-on engineering, I'm interested in larger policy issues. I'm the only Air Force pilot who was selected to attend Air Force Space Command's pure-bred Space Tactics School before it integrated with the US Air Force Weapons School (wikipedia) at Nellis AFB (which now has separate tracks for Pilots, Intel Officers, and Space Operators). I learned about National level activities in space, military ops, national launch ops, launch vehicles, ground site capabilities, and a ton of national and international infrastructure. I'll forever be an ambassador and pilgrim of space capability after my time there. As part of the graduate-level curriculum, I wrote a paper about trends toward intelligent, distributed constellations rather than intelligent satellites. Commercial trends of satellite constellations can be found on Lloyd Wood's satellite page. I've also been privileged to participate in the annual Secretary of the Air Force's Science Advisory Board studies about Unmanned Aerial Vehicles (1996) and integration of Air Force infrastructure into space (1998), and teach the Space Test course at the USAF Test Pilot School. I have expanded my triad of Engineering, Science, and Operation experience, with hopes of being selected for an astronaut position with NASA. 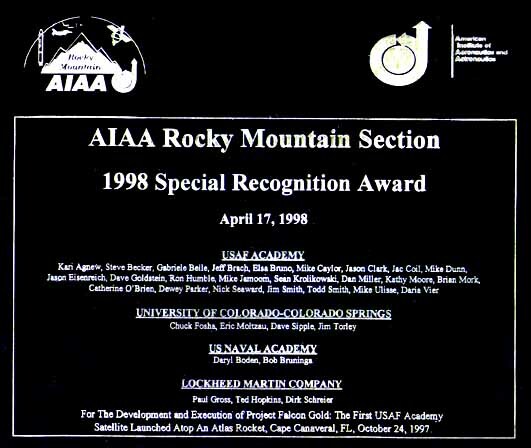 The Air Force Special Flying Programs nominated me in 1993/5/7, but NASA did not invite me to interview. A Spring 1998 visit to the Astronaut and Astronaut Selection offices clued me in to better ways to present my package, and I applied again to the 1999 board as a civilian. I was called for an astronaut interviewduring February 2000, but didn't make the final cut. Paperwork has gone in for subsequent astronaut selection cycles with various levels of success. In the meantime, I watch for exciting work in areas of aviation, satellites or space probe design (in particular software, command & control, telemetry, and autonomous behavior vs. mission determinism). The background picture for this page is a picture of the space shuttle after landing at Edwards Air Force Base. Starting in 2004, I trained and qualified with DDMS as on On-Scene Commander for when the shuttle diverts to Edwards AFB. Riding in a 1970s era modified mobile home trailer, the OSC rides with the NASA commander and is responsible for all DoD supporting organizations such as Fire & Rescue, Security Police, Hazmat, Medical, Public Relations, etc. We did a lot of exercises and I had a chance to participate in one real shuttle landing. This page is maintained by Brian Mork, owner & operator of IncreaTM // It was last modified May 2012. Suggestions for changes and comments are always welcome. The easiest way is to contact me via e-mail.